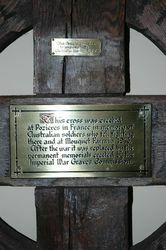 A cross commemorates those who died while fighting at Pozieres and Mouquet Farm in France in World War One. 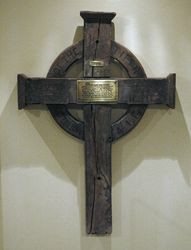 This is the original cross from the battlefield. This cross was erected at Pozieres in France in memory of Australian soldiers who fell fighting there and at Mouquet Farm in 1916. After the war it was replaced by the permanent memorials erected by the Imperial War Graves Commission.